When the enemy were seen advancing on the mountain face opposite us I sent Jack Tainui, my best scout, and another down to the bottom of the gorge to observe the enemy as it was possible to cross the river by leaping from rock to rock. As the enemy, Austrian mountain troops I think, started to cross, he picked them off at close range. I believe he shot three. He told me that one man was only wounded and started to crawl away. He raised his rifle to finish him off and then found that he could not do it. He withdrew in front of the enemy, and in the middle of the main action which followed immediately, he reported to me and then with a grin said he was going down (a matter of about thirty yards) to give the boys a hand as they seemed to be having a tough time. Warned by the firing on its right, D Company was peering into the mist and the enemy was concentrating on the flat where Battalion Headquarters had originally been established. Suddenly, Private Harold in 16 Platoon took careful aim and fired. An enemy scout who had reached the road fell on his back. 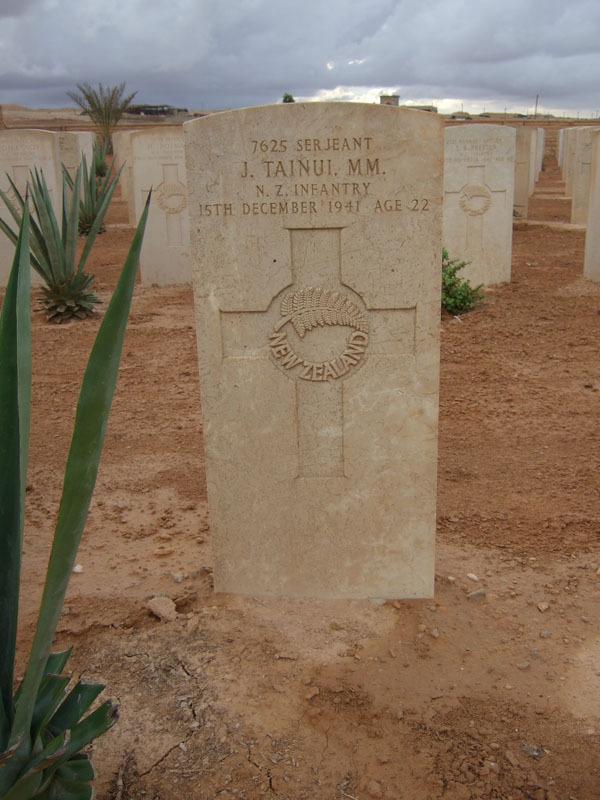 Harold turned to his mate, ‘Old Horse’ Martin,22 and said shakily, ‘Old Horse, I've killed him.’ Sergeant J. Tainui, MM; born NZ 13 Oct 1917; labourer; killed in action 15 Dec 1941.; To Greece - The Germans then appeared to edge still farther westwards seeking for a gap in the sector held by D Company. To prevent that unit being outflanked, 11 Platoon B Company (Second-Lieutenant Pene) had been placed beyond it opposite the village of Skotina, but with the successive westward moves of the enemy Lieutenant-Colonel Dittmer strengthened the flank with 13 Platoon C Company (Second-Lieutenant Reedy). The enemy's approach was carefully observed by three scouts who were sent out as soon as the Germans appeared in front of D Company. One of them, Corporal Tainui, dealt with three Germans and reported that a large number were collecting in the gorge. Sergeant J. Tainui, MM; born NZ 13 Oct 1917; labourer; killed in action 15 Dec 1941. Remember John Tainui by laying a poppy. The National Archives. Recommendation for Award for Tainui, John. (Ref. WO 373/27/359). Military Medal.